Taipei, May 31, 2018 -- Advantech Co, Ltd. (2395.TW), a global leader in IoT Intelligent systems, embedded computing, and UHD 4K/8K video processing solutions, announced their Media Cloud Solutions in Computex. 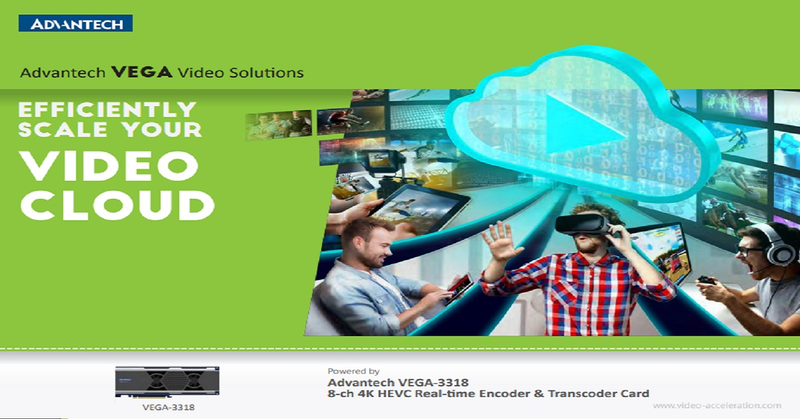 Advantech VEGA-3318 is the world’s first video accelerator able to perform real time, professional grade 8-ch 4K HEVC transcoding in an ultra-low power PCI Express format that can be integrated into standard IT cloud servers via Linux API. Its high density enables efficient large-scale cloud deployments that can greatly contribute to the media industry’s objective of reducing CAPEX and OPEX when building next-generation Live UHD OTT Cloud Services. “Online video content will dominate in the following years and we can see how key players in the media, telecom, and internet industries are positioning themselves in this direction, ” said David Lin, Associate Vice President for Video Solutions at Advantech. “Accelerating this new online video era is in our nature and can show companies how we can help them catch the video wave in a cost-effective and timely manner. We are also seeing an increasing need to lower the cost of ownership by media, telecom and internet companies that are seeking to address the ever-increasing mass consumption of streaming high-quality video, Socionext, as our valued partner, is able to solve the power, density, and performance technical design requirements we are looking for in order for us to develop a cost-competitive, highly-efficient transcoding solution with adaptive bitrate (ABR) streaming capabilities for live cloud media service providers." Advantech, the creator of innovative video acceleration solutions, and Socionext Inc., the world leader in hardware HEVC encoding, have solid strategic partnership for many years. Two companies together provide the live hardware transcoding solutions for the data center supporting MPEG2, AVC (H.264), and HEVC (H.265). Socionext real time dense transcode solution, also known as the "Media Cloud", enables advanced HEVC compression technology and real-time transcoding capabilities for OTT applications. Socionext's extended partnership with Advantech includes the integration of Socionext's Media Cloud technology into Advantech's VEGA-3318 and VEGA-7000 family of high density video servers to enable agile and cost-effective live UHD cloud services for the new video-centric era. Advantech VEGA video accelerators combine the best of the hardware and software worlds by providing commercial-off-the-shelf access to powerful video processing technology that can be deployed in standard data center servers. 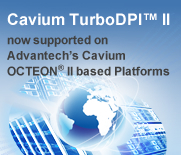 “By leveraging Advantech VEGA-3318 transcoding accelerators, cloud service providers and equipment manufacturers can deliver up to 32 x 4Kp60 or 128 1080p60 live HEVC profiles per rack unit – the highest density available in the market” said Kevin Chien, Product Manager of Video Solution Division in Networks and Communications Group, “This impressive performance can be achieved while still keeping the programming flexibility of software-defined solutions by integrating the VEGA-3318 accelerators into standard open-architecture servers where the heavy-lifting video processing tasks can be offloaded via a standard API to the VEGA acceleration card as if it was another software component.” Each VEGA-3318 consumes approximately 65W of power and, compared to software-only implementations, can replace as many as 8 standard dual-socket servers. 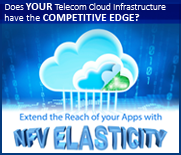 This can massively reduce the space and power consumption needed to roll out the infrastructure that will be needed for the anticipated explosion of content that 5G will bring. The Advantech VEGA 7000 series is a family of accelerated video processing servers which combine best video and IT practices within an off-the-shelf platform that has been optimized to efficiently scale throughput of high-density transcoding applications in live OTT and cloud workflows. Up to four VEGA-3318 accelerators can be integrated into a 1U server to deliver up to 32 x 4Kp60 live HEVC profiles per rack unit – the highest density available in the market. This allows for large scale, energy and cost-efficient data center deployments that benefit from a 20X rack space and power reduction when compared to non-accelerated solutions. Advantech VEGA solutions for the data center minimize development efforts by providing a comprehensive software package that features Linux and Windows SDKs, FFmpeg plug-in and virtualization-friendly drivers supporting OpenStack. 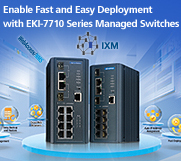 Advantech also offers hardware and software design and customization services for maximum deployment flexibility. Advantech offers decades of expertise in complex hardware and software system integration and design services, Socionext and Advantech have a long history together providing solutions for "Live" transcode broadcasting and processing large volume of media data for video systems. This partnership further extends the close relationship. Advantech will demonstrate their VEGA-7000 Series with VEGA-3318 as the High Density Video Server for the Media Cloud Solutions at Computex 2018 at Socionext’s private suit in Grand Hyatt Hotel from June 5-9, 2018.